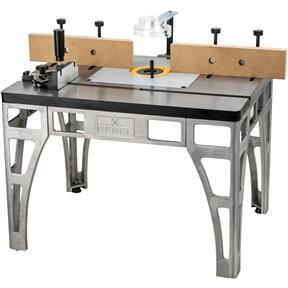 The Rebel® turns any router into a professional shaping workstation. 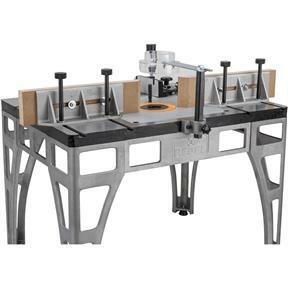 This precision-crafted router table delivers accuracy and ease-of-use that surpasses most shop-built or home center models. 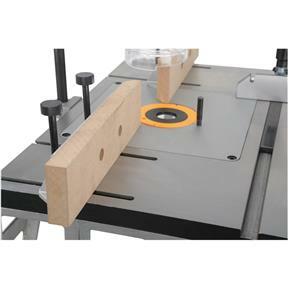 An excellent choice for large production runs or any shaping job requiring easy set-up and superior accuracy. Insert ring opening: 4-5/16" O.D. There has been some discussion in other reviews about the flatness of the table. 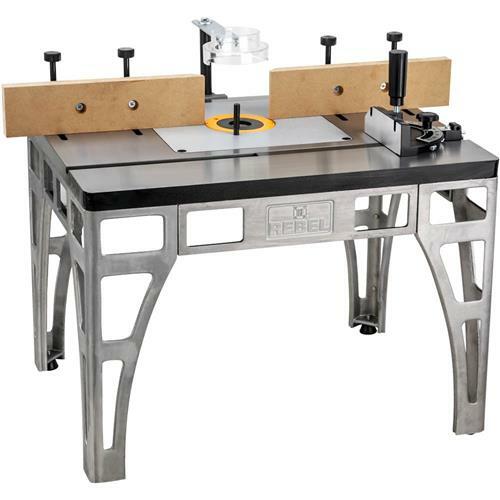 On my example, the cast iron main table is nicely machine and very flat -- well within tolerances necessary for wood working. However, the aluminum insert that you mount the router to is considerably UN-flat. 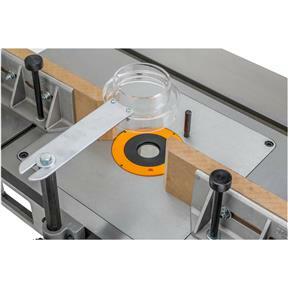 There are four adjustment screws, one at each corner, intended to allow the user to level the insert with the table proper. However, my insert has noticeable dip or concavity across each of the four edges; along one edge the hollow measures more than 1/16". This means it is impossible to make the entire surface flat; either the corners will stand proud, or the middle will will sit low. Grizzly really ought to take charge of quality control here. It was easy to adapt this table to other accessories in the marketplace. 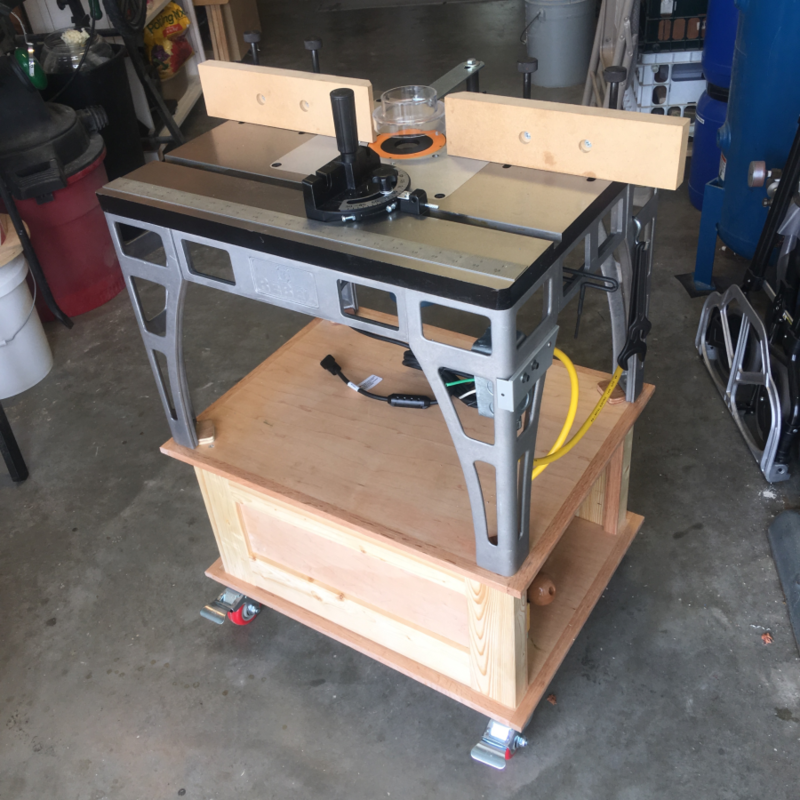 Built a small cart /base with locking casters for the table. Will add bells and whistles as needed. I am very happy with this purchase. I researched this for months. 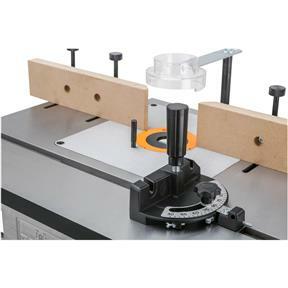 There is no comparative example of a table top router with this build quality and price. Yes, I found there is about a 1/64 dip from edge to middle.....so the surface isn't perfect.......but if you want perfect.......spend the "perfect" amount of money. I was prepared to hand lap and scrape the surface if necessary.....the price is that good. I decided that if I adjust the insert properly, and build this table into my workbench and level with that........my work pieces flow through without hitting any dip .....again....at most it was 1/64. Barely observable. In fact I had to drop a light behind my straight edge and could BARELY shim the gap to measure... The split fence is really nice, since I use this to offset and I use it to plane.....yes, this is the reason for the split fence. So, for all the argument about "why the split fence? ", now you know. If you have a planer, then retool your fence so it's one continuous piece....but, don't argue this is a problem when you don't even have an idea of why it's designed this way. One small thing, I mounted my Dewalt to this table and had to place washers as shim because the mounting brought the machine too tight to the table and the insert didn't have room to drop in. These are the things people complain about, but it appears to me that if you can't do a work around as small as this then maybe using a router in general is more advanced than you're capable of (sorry for the anti-post but the negative posts and reviews are irritatingly shallow). The only real complaint is IF the table runout was excessive or surface was damaged, and secondary to that is if you don't buy the NOT INCLUDED switch assembly. Really Grizzly, why would the consumer NOT want the switch? Just include it and raise the price 10 bucks. 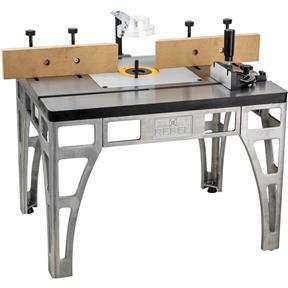 I bought this router table wanting something heavy duty and able to hold up to anything that I throw at it. If you can follow directions its easy to put together and super heavy duty. I wish I would have found and bought this sooner. You can't go wrong with this one.